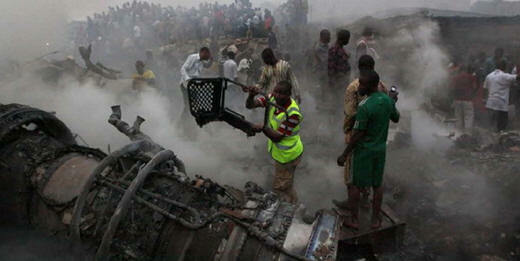 June 4, 2012 - On Sunday a Nigerian passenger airliner that had departed from Nigeria's central capital of Abuja for Lagos, Nigeria crashed while on final approach to Lagos' Murtala Muhammed International Airport killing all 153 people on board. Flight 992 which was operated as Dana Airlines crashed into two story building. The pilots of the Boeing McDonnell Douglas MD-83 had reported to Lagos control tower just before the crash that they were experiencing engine trouble 11 nautical miles from the airport for approach for runway 18L for landing, onboard were 147 passengers and 6 crew members. Flight 992 collided with a power line, slammed into two large apartment buildings and bust into a ball of flames. First responders feared that there may be ground casualties as well, no casualty figures have been reported. Dana Airlines which is based in Ikeja, Lagos State, Nigeria operates a fleet of Boeing McDonnell Douglas MD-83 reported that they have canceled all its flights for Monday June 4th. It has been reported that the fleet of McDonnell Douglas MD-83 were sold by Alaskan Airlines in 2008, when the company upgraded its fleet to include more fuel-efficient aircrafts. Nigerian President Jonathan stated the crash of Flight 992 had “sadly plunged the nation into further sorrow on a day when Nigerians were already in grief over the loss of many other innocent lives in the church bombing in Bauchi state". President Jonathan has declared three days of national mourning. It was reported that the first responder initially has difficulty getting the fire out do to a lack of fire truck equipment and water. Residents attempted to put the fire out with buckets of water. Water trucks were bought in from nearby construction sites.